Crazy Reels – Classic-style slots game from Mazooma! The Crazy Reels video slot is a Mazooma Interactive title, and is based on the classic slots machines that were first made popular in land-based casinos so long ago. There is a really retro feeling about it, which should appeal to slots purists, and it is quite basic which should make it easy for novices to learn. While it is quite a basic game, there is a bonus Repeat Feature which should keep it interesting and entertaining for everyone else. The action plays out over only 3 reels, in the manner of the early slots machines, and up to 5 paylines can be activated on each spin. Players can bet between 0.10 to 20 on each spin, and the game’s RTP is a solid 95%. The Top Jackpot in the base game is 20x the total stake, and all symbols carry the same value. The entire look and feel of this slots game is intended to honour and evoke classic land-based casinos and games, and it does just that. There are traditional-looking slots machines standing on a casino-like carpet in the background, and very bright colours used throughout. The symbols on the reels include apples, lemons, strawberries, plums, grapes, oranges and bells. They can all appear stacked, which boosts winning potential considerably. Flashing lights punctuate every win, and there are old-school controls along the bottom of the screen to make it look even more like a classic machine in a brick-and-mortar establishment. The mobile slots game can be played on desktop and mobile devices, and the retro theme is well-executed enough to immerse players from wherever they are. 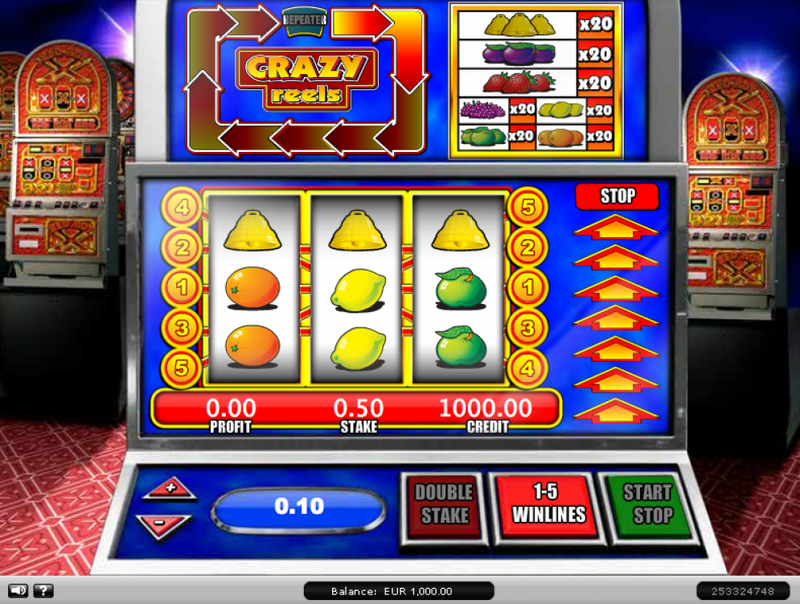 The Bonus Feature in the game is also a tribute to the slot machines of days gone by, and is very similar to pub-style fruit machines. Each time players land a win on an active payline, they are given the chance to repeat the win. Firstly, they will be playing the Skill Game, to the right of the reels, and try to stop the light that moves around the track to the Stop sign. Once this has been achieved, players are allowed to try and win their previous payout again. This is not skills-based, whereas the first stage is, and only requires players to push a button. The lights will continue moving and will then stop randomly. If the arrows stop on the sign that says Repeater, the winning amount is awarded again. The game allows players to choose how they want to enjoy it, in various different ways. Besides being able to play the mobile as well as the online version, they can also play for free as well as for real money. Playing for no deposit allows for practice, and the chance to relax and enjoy the game without any financial concerns. When players are ready to spin for cash, they can choose to activate the AutoPlay feature to keep the reels turning by themselves when they are very busy as well. Modern features blend well with classic charm in this rewarding slot game.